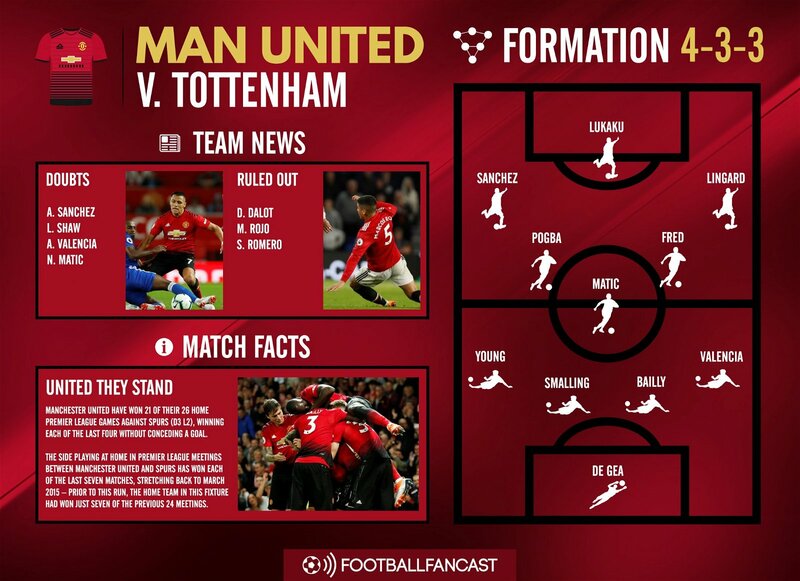 The fixture-makers have given Premier League fans a real treat this bank holiday Monday, with Manchester United hosting Tottenham in an 8pm kickoff at Old Trafford. These sides are key divisional rivals in the race for Champions League qualification and attempting to topple reigning champions Manchester City, but this particular encounter of course comes amid the backdrop of United suffering a disastrous defeat to Brighton last time out – heaping only more pressure on Jose Mourinho – and Spurs becoming the first club in the history of the summer transfer window not to make a single signing since its incarnation. There’s little debating which side has dominated this fixture throughout the Premier League era. The Red Devils have scored twice as many goals, kept almost four times as many clean sheets and picked up 25 more victories. In fact, the Lilywhites previously failed to beat United in the top flight for an incredible eleven years, a dismal run spanning 2001 to 2012. Their record at Old Trafford is even worse; United have won 21 of their 26 home Premier League clashes with Tottenham, Spurs only returning to north London with the victory on a mere two occasions. 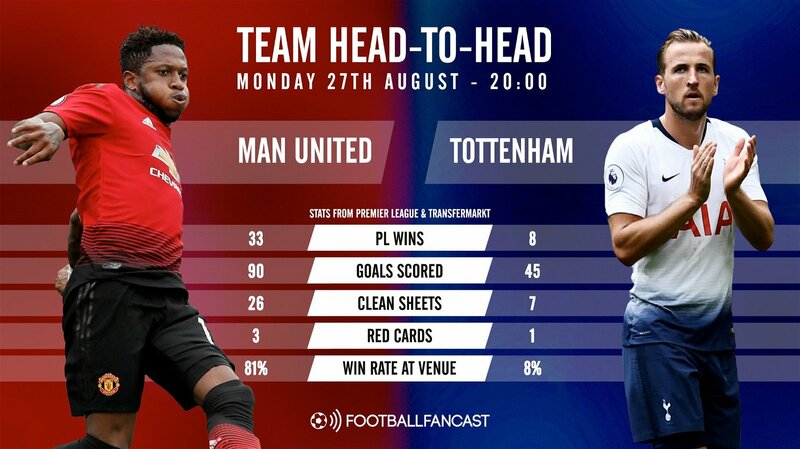 But there has been a psychological swing in this fixture recently; Spurs have won two of their last three against United, although neither came at Old Trafford. In slightly disappointing news for the neutrals, only one of the last eight meetings hasn’t involved a clean sheet. Mauricio Pochettino’s record against the rest of the managerial big six isn’t the strongest and that’s reflected once again here with Mourinho winning eleven of their 15 meetings. The first four of those, though, were back in La Liga when Pochettino’s Espanyol side failed to win any of their games against Real Madrid – to an aggregate score of 13-0. There have no doubt been some key improvements since Pochettino arrived in England, however it did take until New Year’s Day 2015 for the Argentine to finally break his duck against the Portuguese, in a famous 5-3 win at White Hart Lane that first announced the Lilywhites as genuine competitors at the top end of the Premier League table. 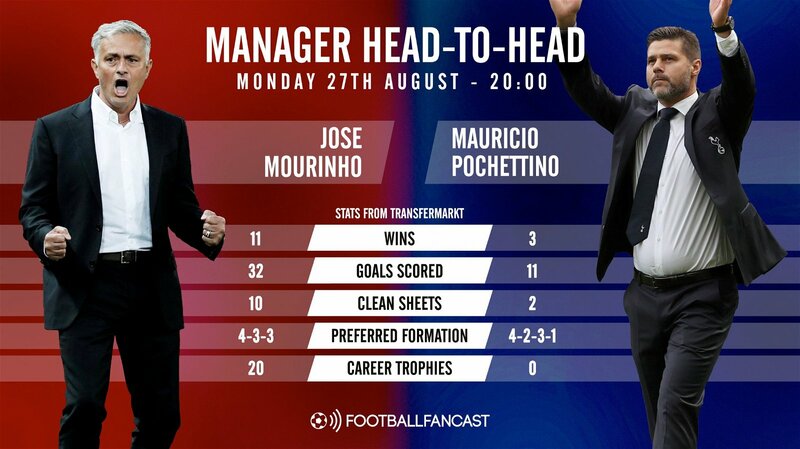 Pochettino’s won both of his last two home games versus Mourinho, but has only ever suffered defeats to him when on the road. If there’s one thing both managers need to know about Craig Pawson, it’s that he’s willing to make big decisions – too willing, some might even argue. 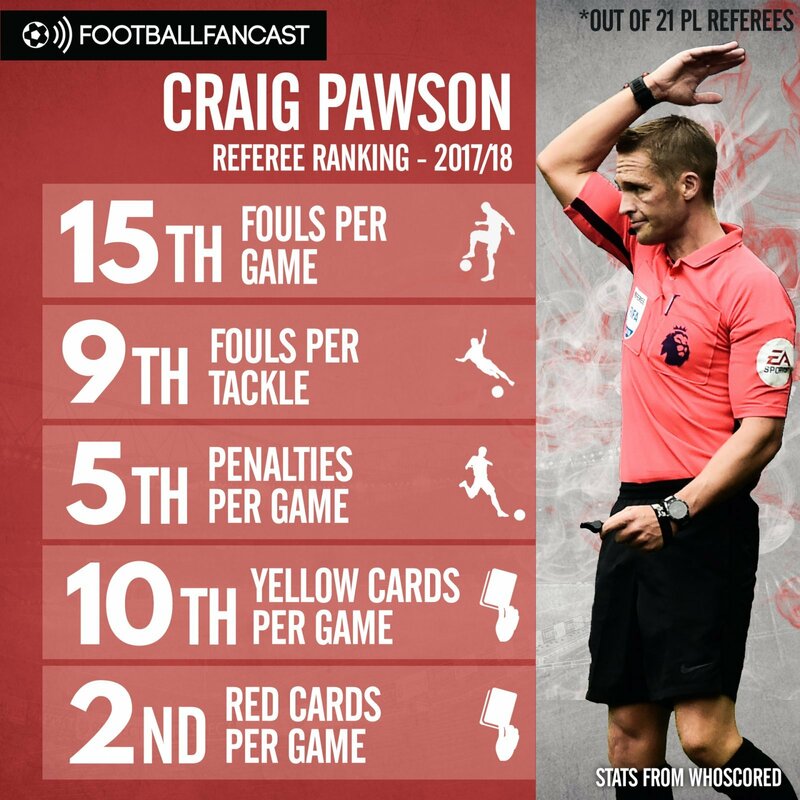 Although he ranked relatively lowly throughout the 21 referees to work in the Premier League last season for fouls per game, fouls per tackle and yellow cards per game, just one referee averaged more red cards per match than Pawson while his penalty return was comparatively high as well. Not much has changed this term either – in two appearances, he’s already awarded a penalty and sent off Phil Jagielka and Isaac Hayden. Considering how close Monday night’s game will likely be at Old Trafford, don’t be surprised if one of Pawson’s decisions ends up being the most decisive factor. Mourinho and Pochettino need to ensure their players are on their best behaviour, especially inside the box. For all the understandable criticism of United’s abject performance against Brighton last time out, it’s been quickly forgotten that some key players and personalities within the squad were absent from the Amex Stadium. Trio Antonio Valencia, Nemanja Matic and Alexis Sanchez – who boast a whopping 256 international caps between them – could all return to the starting XI if they recover in time, adding experience and quality to every department. We’re expecting more changes though with this team seemingly in need of a serious shakeup. Chris Smalling could come in for Victor Lindelof to try and give some leadership to a United backline that desperately lacked it against the Seagulls, with Ashley Young returning to the left-back role he impressed in for so much of last season to make room for Valencia. Juan Mata, meanwhile, may find himself missing out for the more athletic and mobile Jesse Lingard as the last of five changes for the home side. Tottenham, meanwhile, are unlikely to make many changes from the starting XI that was fielded last time out in a 3-1 win over Fulham. 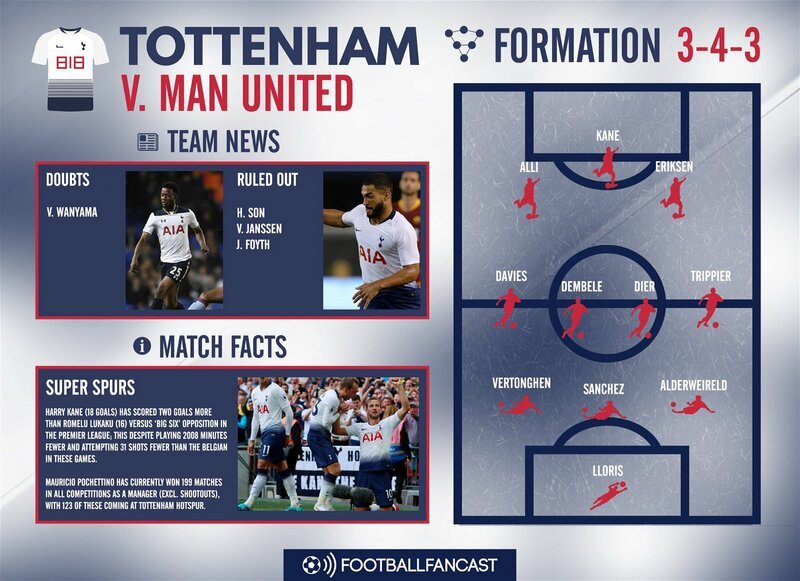 That was set up in an England-esque 3-1-4-2 formation but while the back three should remain in tact, we’re expecting Pochettino to tweak the system slightly to add a little more defensive protection, reverting to the 3-4-3 that has become one of the north London side’s main tactical ploys over the last few seasons. Despite scoring against the Cottagers, that could see Lucas Moura dropped to make room for Mousa Dembele in midfield alongside Eric Dier. After featuring at the World Cup the Belgium international is yet to make a start this season but this game feels like the right time to bring him back into the fold after two outings from the bench.